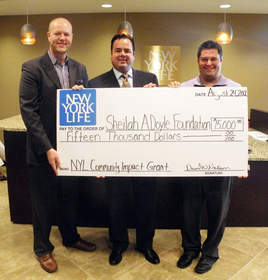 OAKBROOK, IL--(Marketwire - Sep 11, 2012) - The Sheilah A. Doyle Foundation (www.sadfund.org) announced today that it was awarded a $15,000 Community Impact Grant from New York Life to sponsor the second Comfort Zone Camp, a camp for bereaved children, in Illinois. "We are grateful for New York Life's continued investment in our program. Our hope is to help the children we serve know that they are not alone," said President of The Sheilah A. Doyle Foundation Board and Executive Director Kevin Doyle. "New York Life is proud to support The Sheilah A. Doyle Foundation, a local organization that transforms a child's future by providing support and assistance to children ages 7-17 whose parent, legal guardian, or sibling fell victim to homicide," said David N. Nelson, partner of New York Life's Western Illinois General Office and a Sheilah A. Doyle Foundation board member. "It's gratifying to work for a company that strongly encourages its agents and employees to give their time and talents to help make a difference in the community." The Community Impact Grant program awards grants of up to $25,000 to local nonprofit organizations which address the needs of the community and are supported by New York Life agents and employees. Two hundred eight grants totaling nearly $2.5 million have been awarded since the program's inception in 2008. The Sheilah A. Doyle Foundation is a 501(c)3 non-profit organization that provides support and assistance to children ages 7-17 whose parent, legal guardian, or sibling fell victim to homicide. Through our partnership with Comfort Zone Camp (www.comfortzonecamp.org) and our college scholarship program, we believe that we can transform a child's tragedy into a bright future. For more information, please visit www.sadfund.org. *Based on revenue as reported by "Fortune 500 ranked within Industries, Insurance: Life, Health (Mutual)," Fortune magazine, May 21, 2012. See http://www.money.cnn.com/magazines/fortune/fortune500/2012/faq/ for methodology. ** Source: Third Party Ratings Reports as of 6/22/12. Pictured from left to right: Dake Hubbard, director of operations of New York Life, Dave N. Nelson, partner at New York Life and board member at the Sheilah A. Doyle Foundation and Kevin Doyle, founder and executive director at the Sheilah A. Doyle Foundation).